Not to consent you but being a good guy I would share a very simple way to access all restricted sites in your network by using proxy sites.Proxy sites are designed to bypass network restriction or browse the web anonymously however, it would only work if your PC is connected in the Internet and if the IT guys are noobs that they don't implement any proxy blocking or filtering methods.lol..
To start, just open any browser >>copy and paste any URL below >>type the social site URL in the box>>Enjoy your time! 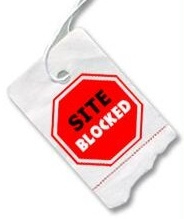 Thousands of proxy sites to unblock facebook, twitter, Google Plus and any restricted web page you wish to access. Please don't be so confident and abusive, think if someone would catch you in action. If you know the trick yet then, share it to others.That's all and Have fun!